A bread roll, I think, elevates dinner to dinner-party status. And garlic bread is always a winner here on a Saturday night. So these slightly more eloquent bread knots are easy to put together and delicious to eat. For someone who just loves social media and technology, it took me a while to get on the whole Spotify bandwagon. No pun intended. And, if I’m perfectly honest, the whole subscription element was also a little scary. Shouldn’t have been as I use Sage One for my accounts, and that’s based around a subscription model. And seeing I was marketing for our Sage Business Partner business until recently, I should have been listening to my own propaganda. As I often work late, and have a longish drive home, I often turn on my playlists in the jeep and sing my lungs out the whole way home. I’m bringing you through one of my favourite playlists. I’m an awful person for identifying life events, or periods of time with different songs, and sometimes I just identify with a lyric or two. really resonate for me. Very real world lyrics in a world of fake everything. Next- Feel it still . Another one on the list for none of my usual caveats. I simply like this song, as it reminds me of another. “Wait a minute Mr. Postman”. And no, noone else seems to get it either. Both Ed Sheeran songs are there,well, because it’s easy listening and singing, especially “I see fire“. “Take me to Church” well, that voice. Who could ignore it. And he’s an Irish entry. Supporting local and all that. “Run” by Snow Patrol is a family favourite. Well, a favourite of the youngest and myself. More her favourite than mine…. I never was able to get the Greys Anatomy soundtracks. Mores the pity. There were some EXCELLENT covers. Run was introduced to a very wide audience thanks to Greys. The Killers are top of my Spotify list of bands. I was very lucky to be in the presence of the great Brandon Flowers. And he can do no wrong. “Symphony” is on the best lyrics list. Corny, but goody. Songs from “Moulin Rouge” make the list because I was in labour watching the film for the first time, and whether I was delusional from the pain, or simply unbelieving that Ewan McGregor can sing- both of the songs are good belters for the car. So there were are, the first half of a long playlist. So what’s on YOUR spotify playlist? They say an army marches on it’s stomach. Well, I’m not sure about an army, but I certainly do. But sometimes when I get up early I’m not really in the hungry phase, and breakfast seems an effort. And if you don’t have time to make the whole scrambled eggs or french toast buffet selection, then porridge is the go to option. 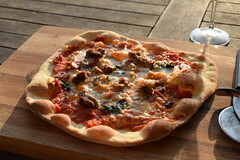 I am holding a number of supper club nights over the summer at our home at Clonfadda. What’s a supper club? Basically I’m opening my home and kitchen up as a kind of underground restaurant. You can book in with 6 or 7 of your friends, or book yourself in and meet new people. One of my extended family lives in Turkey, and she very kindly gave me a bottle of organic olive oil to try. 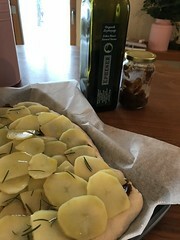 I use olive oil in practically all my savoury (and some of my sweet cooking too), so the struggle was real as to what dish to make to showcase this gorgeous product. The first positive is the aroma. Epheser Olive Oil is positively buttery, which, for me, is exactly the association you need. It’s organic which makes it better for me, and my family. Making my food better as a result. And did you know Olive oil tasting is as much of a science as wine tasting? 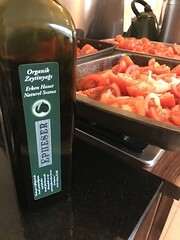 Epheser Olive Oil is Turkish, and as a land associated with year round sunshine, I can almost picture the olives bursting with sunshine! The Ab-u Hayat farm only squeezes and bottles olives from its own olive gardens at the top of its own olive tree farm. 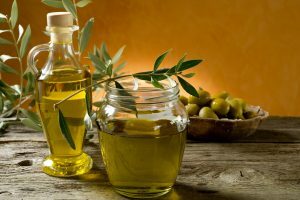 This kind of production is rare, with very few olive oil producers in the world producing like this, and therefore the production amount is limited. The olive oil is squeezed from green and healthy olives and I can imagine it smells like freshly cut grass. When you think of olives, you probably wouldn’t immediately classify them as a fruit. But indeed they are. The olive is the small, bitter-tasting fruit of the olive tree. Olives are classified as fruit because they’re formed from the ovary of the olive flower, and they are seed-bearing structures. Olives can be picked when unripe and green, or left to ripen on the tree, their colour changing to purplish-black. Either way, they are too bitter to eat straight from the tree: they need to be treated first, often by being soaked in brine. Funnily enough I am not a fan of olives, although the large green ones stuffed with garlic always have the most wonderful aroma. In the end I went with pizza. As I could use the oil in the passata, the dough, and as a finish to the dressing. Perfect. In Every Way, I look forward to them stocking it in Ireland! Prior to the 17th century, treacle was used as a medicine; it was considered very good for the blood and was therefore used in antidotes to poisons. It starts cropping up in recipes for gingerbread in the mid-18th century. Jane Grigson mentions a gingerbread recipe from 1420 in her book English Food where spices and breadcrumbs were mixed together with plenty of honey to make a gingerbread that did not have any pastry crust. And although the name implies the tart is made with treacle, from when golden syrup was more readily available, treacle was rarely used. I always have breadcrumbs in the freezer, the upside of making so much bread. Fresh soft white breadcrumbs are best, but I used a mixture in this case. First make the pastry. Rub the butter into the flour, until it resembles breadcrumbs. Add the salt. Add in the water 1 tablespoon at a time until you see the mixture coming together. Once the pastry has formed into a ball, knead briefly and wrap in cling film and place in the fridge. 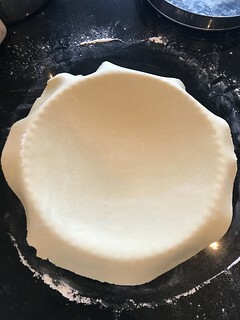 Leave the pastry chill for about 30 minutes then roll it out gently to fit an 8″ fluted tart tin. I don’t need to grease the tin as mine is well weathered but if you are using a new or nearly new tin then grease it first. Return the lined tart tin to the fridge to rest while you make the filling. Roll out the leftover pastry into strips to make the lattice on the top of the tart. Lie these on some baking parchment and refrigerate. Pre-heat your oven to 180ºC, and put a thin baking sheet on the rack. I wouldn’t normally advocate using an extra layer under pastry but in this case IF your filling leaks, you won’t thank me for the sticky mess on the bottom of your oven! Next heat the butter in a saucepan with the golden syrup until the butter is melted. Stir in the spice, the breadcrumbs and the cream. 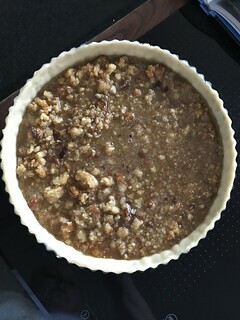 Remove the tart shell, and the pastry lattice from the fridge and gently spoon the breadcrumb mixture into the tart. 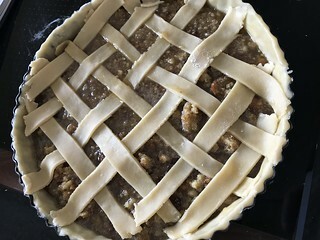 Brush the edges of the tart gently with the egg wash and carefully place the lattice on top, pressing into the base to seal. The filling looks a little mean the size of tart tin, but the filling will expand and also with such a sweet centre, less is most definitely more in this case. Egg wash the whole lattice. Place the tart on the baking sheet in the oven and cook for approximately 25 minutes. Leave the tart cool in the tin for about 10 minutes then take the tart tin off carefully. Place on a cake plate to cool. Serve warm of cold with some softly whipped cream. Enjoy the decadence and and nostalgia. Divine.